For the first fourteen months of his life he fell asleep in my arms every single day. Then he stopped nursing, and the idea of him falling asleep somewhere else felt sorta freeing. Now, two and a half years later, he almost never falls asleep in my arms. Today, after having lunch with Aunt Mimi and having a hair cut, we got home and he had to take drops for his lovely new pink eye. He was tired and didn't feel well and it was all a little stressful, so after a big hug and being told he was super brave for taking his drops, I asked if he wanted some chocolate milk and a movie, or did he just want Mama to hold you for a minute. He said "No milk. No movie. Mama just hold you for a minute." And he curled up and went to sleep. It felt worthy of a picture. Because even though it used to happen every single day, I can't remember the last time he did this. And who knows how long until he does it again. My sweet boy. He sure is growing up fast. 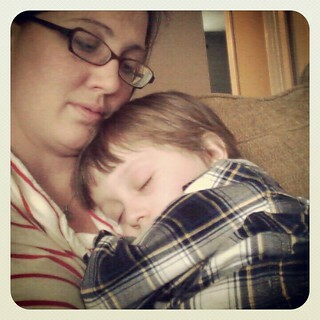 For today, I am so glad that his safest place is still his mama's arms. A beautiful post to capture a beautiful moment. This made me all kinds of weepy. Such a beautiful picture.